Conclusions: Xylitol dosing for children. For small children (ages five and up), it seems that a xylitol level in the neighborhood of 5 grams per day (divided up into three to five doses spread throughout the day) would be appropriate. The American Academy of Pediatric Dentistry's 2011 publication "Guideline on Xylitol Use in Caries Prevention" seems to suggest an amount in the range of 3 to 8 grams of daily exposure (in divided doses throughout the day), even for children under the age of 4 years. In all cases, your plans for creating a xyitol regimen for your child should be discussed with and evaluated by their dentist. As children pass through their teens (as their bodies become more adult in size), a regimen leaning more toward the lines of that suggested for adults would be appropriate. Regardless of age group, a child's regimen needs to be continued for six months to a year before it can be assumed that an optimal level of anti-cavity protection has been established. With the levels mentioned above, any health concerns associated with xylitol consumption should be moot (with the exception of the development of minor gastrointestinal side effects that will vary on a per-child basis). As evidence of this, Vernacchio (2007) evaluated (with emphasis placed on the development of gastrointestinal side effects) the consumption of up to fifteen grams of xylitol per day by children 6 through 36 months in age (as a preventive measure for the medical condition otitis media). 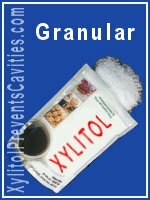 Granular xylitol poses less choking risk for small children. This study concluded that xylitol use at this level over a 90 day time period was well tolerated by young children. Some types of products may not be appropriate for small children. The American Academy of Pediatrics recommends that hard, gooey, or sticky candies, as well as chewing gum, should be kept away from children younger than age four because they pose a risk for choking. For children in this age group, xylitol syrup or jam may make a good delivery vehicle. Another good choice would be to simply sprinkle granular xylitol onto the foods they already eat.